In the previous post, I showed you some ways fairy/elven symbols were combined to make working magickal symbols. In this post, I’m going to show you five fairy power symbols that were given to us by the Elves of Fyn. I will tell you how to really work with them in the third Fairy Magic post but for now, know that just placing/hanging them in your room with draw their energy to you. 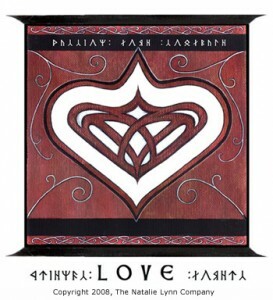 Displaying this flag in your home will draw good fairy energy and power to you and show that you are a fairy friend, encouraging them to visit and communicate with you. One of the first symbols we received, this love and friendship symbol features a heart within a heart to illustrate that two hearts can become one. 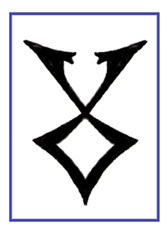 Having this symbol in your home will intensify and draw the power of love to you. Two great Elven birds huddle protectively, guarding the center, each watching the other’s back . 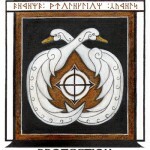 The symbol in the center shows a center circle being protected by two crossed lances, each end tipped with an arrow, allowing nothing to penetrate the sacred center. This is the Elven symbol for protection. 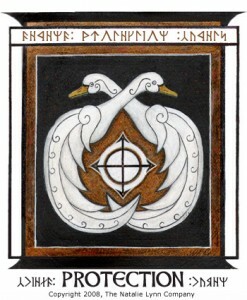 The colors used are the classic colors for protection, black, along with the color white, adding power and purity. 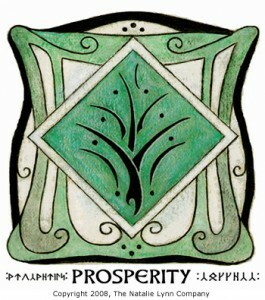 The center tree-like symbol is a prosperity symbol given to us by the Elves. It can be placed in your home to draw the energy of prosperity to you. The green color was used because it is the color of prosperity and abundance (and also the color of money!). Update: Hi Everyone! Because of the number of comments on this post, I am moving all further comments to the forum. It would be very helpful if you could try to stay on topic or create a new topic if you would like–it makes it so much less confusing that way. Thanks so much! Hi again! we can print the pictures out if we can’t buy then right. What if i get the symbols printed in black n white? Will it be ok? Yep, no problem if you want to print them out for your personal use (just please don’t sell them). Black and white should be just fine. Thanks for asking! I made a desktop of the prosperity symbol to use for my desktop so I would have this in my office. I had to make it larger to fit the my desktop and found the background hurt my eyes so I used some of the background colors to make a background and made it look as though it is printed on parchment. Besides that it is exactly the same. It would be easy to do this to the others. I thought you might like to make these available to visitors to your site. I would be happy to send you the photoshop file I have been working on so you will be at least 3/4 of the way there on “Prosperity”. Then you could just use the template and stick the others in, once they are the right size, in different layers. Or you can wait until I have worked on them all and I will send all of them to you. Moe – that would be wonderful, I would love it! Can you send it to me @ [email protected]? i drew the healing symbol and used the blue colours in different shades and all…but i drew a few extra lines (my little bro)…so its not exactly the same…will it matter much?…i spent a lot of time in drawing that. I don’t really know but why don’t you try it and see if if works? I might be perfectly fine. 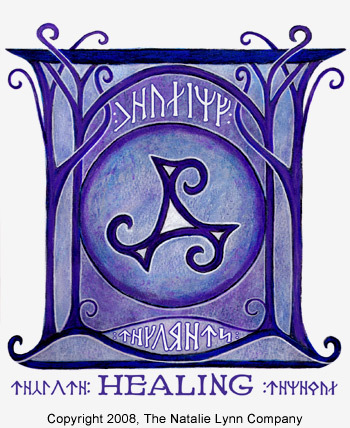 and one more thing, what exactly should i be on the look out for…what kind of change will the healing, truth or prosperity symbols bring about? In general, the symbols are energy enhancers and attractors and will bring the energies of healing, truth, and prosperity to you. How well they work depends on your belief system and your ability to use this energy when it is present. It sounds to me like you have a very strong connection with the fairy world (and other worlds too, possibly) and have, over the years learned to communicate with them and work with them–that’s so great!. I have heard that some fairies are with you your entire life so it was really good to hear you mention something like that. Also, it’s really nice to see that your granddaughter is able to have an experience with them that will possibly last a lifetime too. You mentioned “They speak to me in my mind and make me do things for them,” and I just wanted to make sure they aren’t “making” you do anything because that would not be a good thing. It’s probably just a Spanish to English thing but I wanted to say something just in case. I’m guessing that the fairies you are connecting with aren’t making you do anything but are suggesting things to you that will work to your benefit. Thank you for adding your experiences here even though it was difficult for you to write in English– it is really helpful for everyone reading here, especially those from your country who might not think there are fairies where you live. By the way, I think your English is very good – much, much better than my Spanish, believe me! It was very sweet of you to thank us–we appreciate it very much and you are very welcome! No they didn’t told me that I’m a fairy too. My name Naida mean “Ninfa de las aguas y los rios” And my second name is Leticia and means …happinees and joy. Cuenta la mitologia griega que Zeus envio a todas las ninfas a habitar en la pleyades . Las saco de este planeta porque las estaban maltratando cuando se contamino el planeta con la codicia , ect…. Im here in this planet because I decide to help people and specially prepare people to past away to the other word. I alredy Know this is not the thruth of our life. The thruth is in our spirit. So thank you for the work that bouth of you are given to the world by let them know thats more than they think in this planet and more living worlds around us than we ever imagine. When I said they make me do things for them,,,, I mean to said that they susggest to paint my room in pink and blue, green all ligth colors..and something else that i din’t do,,,put white spots in the walls and draw fowers…things like that color and things that make them and me ..(the way they seee…)more happy.But I did what I want.Not allways I do what they suggest, and they never feel angry about it.They asked me to put in my front yard flowers and i did it because i like flowers… ect… never do things that I don’t want too. Sorry always with love Naida….everibody saids that I,m like a child…always happy and in good mood. Hello I am 19 years old. Yes it is ok for ‘Christians’ to believe in Fairies and in other worlds. I am not of any religion but I do know that ‘God’ created the worlds we see and those we do not and the energy behind it all. There is an ultimate source of all energy and I do not find anything wrong in belieing what God has created. I also believe that we have a responsibility once we can contact Fairies or other worlds. I believe we should be safe and smart and protect ourselves and also to state our intentions in contacting other worlds/realms. Thank you for this site. You are very welcome and thanks so much for your post – I am in agreement with you 100% and I couldn’t have said it better myself. Thanks for making a great contribution to our site! Yes, they are real but they aren’t always seen as you see them in movies, etc. I’m not exactly sure what your question is so could you ask me again and I will be happy to answer it for you. i really love faries. they play tricks on you!!!!! but they are fuuuunny and beutiful. Yes, the definitely love to play tricks! They are pretty funny sometimes – at least I think they are! i just thought of something from when i was a little girl. When i was younger i was always drawn to the concept of fairies, i don’t know why it was just something about them. But, one night while i was lying in my bed something clicked in me and i knew i was different than most people. Like i said, i was younger-probably 5 or 6- but ever since that night i have felt different and been able to understand more. Sometimes i search for fairies, i believe they exist… but a part of me is holding back and i can’t make it go away. i use to make up make believe games when i was young, one of them quite strange now that i come to think of it. My dad met some people and as a gift they gave me an assortment of different quartz stones. i loved them and anything that resembled them, i thought they were beautiful. That night i played a game with my stuffed animals. I had to do som ething on the other side of the house so i took one quartz stone with me and left the rest with the stuffed animals. I leaned down low towards them and whispered quickly, “If you need to tell me something just talk to me with this,” and i pointed to the stone. I left the room, nothing ever did happen… sadly. But, now that i think about it, it is rather strange that as a little girl i would say something like that. Do you think that has any significance to the fae people trying to contact me? By the way, quartz is a great energy enhancer and helps attract and focus fairy energy. How lucky you are to have both fairies and angels in your home! I love your story about the smoke alarm – good thing you know the difference between that and a real fire 🙂 . I want to know how to use fairy magic? You said you want to learn fairy magic and we are working on that right now. As a matter of fact, we are going to be teaching some classes here in Traverse City (Michigan) soon and will be able to transfer that information to this blog some weeks down the line. Hope you can hang in there until we get to it! I want to know if i am a fairy or a witch how can I know which of those is me? A witch, as you put it, is, in modern times, usually someone who practices the wiccan religion/beliefs and they are commonly referred to as a wiccan, not a witch. Anyone can make the choice to study, follow and become a member of that group if they want to or even practice on their own (solitary) if they desire. Now being a fairy is a totally different matter. If you are talking about being a faerie-kind in a human body then ultimately, you are the only one who knows if this is what you are or not. However, you are not alone in this–there is a group of people known as Otherkin, primarily Internet-based, who identify in some way as other than human. They might be able to help you figure some of this out. A good starting point might be here and here. Thank you answering my Question!! how can i know what kind of element i have? why i cant use my magic? what do fairies look like and if witch is wiccan and what is fairy? Well, there are lots of different types of fairies and each type looks different. We (as humans) sometimes don’t see them clearly and can see them as orbs of light or as a mist, or as a blur out of the corner of our eye, etc. As for your second question, it seems like you are confusing two different types of things. Wicca is a belief system or religion and fairies are a type of being – not the same at all. HEllo there, was just wondering where you got the heart within a heart symbol? and I understand its your artwork and should not be copied, but surely the heart within a heart was not created by you? would love to hear your feedback, you are truley talented! Well…like all the artwork here, the Elves of Fyn gave us the symbol and I kind of elaborated on it a little bit and added my style here and there but it is essentially from the Elves themselves. PS: Thanks for your nice compliment – I really appreciate it. The other night I had this dream, which prompted me to search about witches, fairies, etc… I somehow ended up in this site, and as I scanned through those symbols, I remembered something. I remembered seeing that fairy flag in my dream, although the fairy flag in this site and the fairy flag in my dream have a few differences. That’s fascinating…can you tell us anymore about the flag in your dream? Where was it, what were the differences, etc.? 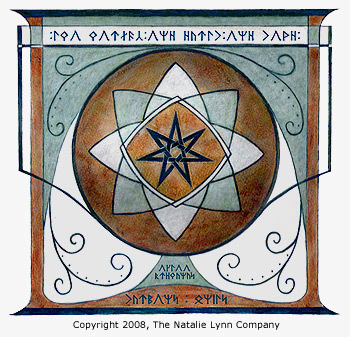 According to the Elves, there are many groups of pro-human elves that use the faery star and the 8 cluster behind it. Because sometimes we get posters here who are quite young (7 or 8 ) which is fine but I wanted to be sure that the advice I was giving you was age appropriate. I think you will probably find the best answers at the links I have already given you. I can’t really answer questions about “witches” because that is not my area of expertise. thank you now i know im a fairy but i lose control to my power how can i fully control it? When you first saw a faerie did it scare you. Im’a kinda freaked out that they may like pop up and scare me, or like hide in my closet and when i opens like scare me again. Or are faries something that we can only channel and see through our minds. Because if i saw a mist or light orb in my house i would totaly freak, i need to know if there are and evil faries that can do harm to me or my family. Thanks for the website. I’m thinking back to my earlier experiences and I don’t think it exactly “scared” me – because I never felt in danger–but it did have a surreal feeling to it and my sister Susan says she was sort of “creeped out” to begin with. Our most frequent response in the early days for sure was astonishment, a sort of “oh my God” or “what was that?” type of response. I really don’t think that the good fairies are out to terrify you–they may pull pranks and tricks on you but it is generally a good natured type of fun–that’s their intent, anyway. They usually do this type of thing to get your attention and to have you acknowledge that they are there (and they exist). About bad fairies – they don’t hang out where there are good fairies so attracting good fairies is always a great way to prevent them from bothering you. If you are worried about them, it is always a good idea to use the fairy protection rune and put it near a door or window in your room. PS: You are very welcome – thanks for the great questions! can you tell the elves that i love the symbols their sooooooooooo mesmarising. Thanks for the compliment, I will pass that along to the elves. I want to know if fairies can fly? and transform from human to fairy from fairy to human? Yes, there are several types that fly, pixies being a very common type that does that. I don’t think they “transform” from human to fairy but maybe some shapeshifter fairies can appear to look human at times. Firstly, I wanted to say thank you for taking the time to write this informative and inspiring blog! Well, I am 21 years old and recently became very interested (and enchanted) in the concept of fairies and the “other world”, so I’m quite new to the subject. As it happens, my family and I will be moving out of the U.S.A. to a more nature-oriented area of Germany in the next few months, and was wondering if you think I’d have a good chance of seeing any fairies or elves there…? Also, is it more likely to see a fairy ‘in your mind’, or physically with your eyes? Does it take any amount of time for a fairy to ‘show itself’ to you fully, and do they usually show themselves as “balls of light” or mists first? One more thought: Is there any sort of person which fairies or elves may NEVER show themselves to…? Thank you for your help, I know it’s a lot of questions! Welcome – it’s great to have you here! And, thank you so much for your very kind comments -that was very nice of you to say. How interesting that you are going to Germany soon – The Elves of Fyn have said that their country of Fyn encompasses parts of Denmark and parts of Germany in their world so my guess is you should have no trouble finding some fairy residents there. As far as seeing fairies goes, I have often seen them with my physical eyes as orbs, balls of energy and mists. In meditation or semi-meditation, I have seen them in the more conventional fairy or elven type shape, if that makes sense. I think it is easier for them to be seen as orbs and energy balls so that may be the most common way to see them. Yes, I do think there are some people that fairies will not reveal themselves to. Negative people and people that really don’t believe they exist would probably be in that category. In fact, they seem to be rather shy in general and usually like to show themselves more and more over time. But even as I write this, I’m thinking there are probably exceptions to this rule and times when they will just show up right away, bold as can be 🙂 ! It’s nice that you want to connect with the fairy world – I think they may be behind your recent interest in them so you might want to watch your environment for signs that they are around. Good luck in Germany and please let us know how it is going. Or can I draw them! And do they have to have every perfect detail including colour? You can print out the symbols if you want – just please don’t use them for any commercial purpose (I don’t really think you were planning to do that but I have to mention it anyway). You could also draw them if you want to, you don’t have to have every detail perfect but I would try to use the same color whenever possible. And no , I wasn’t going to use them for commercial purposes. Also, how do you write stuff ( like on the picture ) in fae language? You’re welcome! You asked how I do the writing on the symbols, etc. The writing is not exclusively a fairy language (although they would probably tell you they invented it 🙂 )–it is celtic runes and they correspond to the english alphabet and we used them that way. Hi can you explain how fairy dust work? um if u print them out can they still work??? Yes, you can print them out and they will work fine. Please just for your own personal use only. what is the most commonly used language fairies speak? Oh also I live in kind of central scotland. 🙂 There are many places like forests and stuff where I live. I just call them ‘The Woods’. I was there just recently! The one I went to is a bit further away than where I live. There is a big park/forest where I live, but it’s a very ‘touristy’ location, so I don’t enjoy it as much as the other one. If you want any info about the park/forest/wood places you can e-mail me. I wanted to know, our fairies against Christianity in any way? My parents believe they are, and I’m trying to disprove them. I have never heard them say or do anything that would be considered even slightly against Christianity. On the rare occasions that I have heard the Elves refer to Christianity, they always speak of it with respect. Of course, I am only talking about the fairies that belong to the Group of Eight (the seelie) and not the dark fairies. Remi, I agree with Natalie. I’m in my late 40’s and am a Christian. I never knew they actually existed until I prayed that Jesus would show me– would “lift the veil” so to speak. Well a month went by after my prayer and then when I wasnt expecting it– I saw a woman faery or Brownie looking at me while I was depressed from a family argument. She actually was resting in my hair, and was looking at me with empathy- Christ shown out of her eyes as she was mirroring my pain. Her features were very exquisite– her wide-set eyes were all dark brown with no irises, and yet were full of love. She had a delicate nose, mouth and high cheekbones with high browbones– She looked very elegant. She looked innocent and humble yet regal– with no pretentious attitude. After a few seconds of me gawking at her in shock, she then noticed that I could see here, and had a shy expression on her face and dissapeared right in front of me. I felt her presence with me all day and thanked God for allowing me to see one of His workers for His Kingdom–who work in other Realms. So– your parents are right to not accept everything unless the Holy Spirit confirms- That’s why I put the matter before Christ that HE would show me.- and He did not dissapoint me . I was 45 when I saw this Faery– I’m 46 now. ive printed out one of those signs that keeps bad faries away will it still work? Yes, printing the signs out should work just fine. First of all, i would like to thank your for your effort answering people’s questions about fairies. I can’t imagine how busy you are. I live in the Philippines and i’m wondering if Elves exists in my country. I would love to try those fairy symbols but i’m wondering if they’ll work in my country. I do believe that fairies sourounds me most or all of the time. Yesterday, when i first landed in your website because i was looking for a truth story about fairies, i spent almost 7 hours reading the member’s comments and answers and some of their experiences are the same as what i have experienced about fairies like seeing the orbs, ball lights, fast moving object from the corner of my eyes and even someone talking in my minds. When i was a kid i clearly still remember that i was chasing by a ball of fire it was sort of ghost fire (im not sure what was that, im only sure it was an unusual thing) I runned as fast as i could but the ball of fire was able to hit me and i suddently slipped and fell down, when i fell down i felt that im floating up gradually but it was weired becauase i could see my body left on the floor ( i fell upside down by the way and my face was facing on the floor) then suddenly my mother woke me up because she heared me screaming, and then my mother was asking me i slept so long cuz’ it seems that i slept so long, she notice that in my eyes.. I’ve experienced most of the time that someone talking to me in my mind like calling my name or sometimes suddenly answers me when i have a question in my mind, sometimes specially when i had a nightmare and i couldn’t move, during this time i start to pray and when i starts to pray there is someone in my mind that plays around with me and makes me annoying by distubing me while im praying, i suspect that it may be a bad fairies. Last night, i was wishing for the fairies to come in my dream but i had a little doubt that it wont happen so i would’t happen as expected ;), Early this morning when my wife woke up, she usually wake up early to prepare things for daily office work, she turned the light on and i saw a big flies flying around the flourescent about a half inch long, i could see it cuz’ i was laying in the bed and looked at it, i started to think that it may be a fairy and i made a bet to my self that “if it’s a fairy then it should fell down right on me if my wife turn the light off”. As soon as my wife turned the light off, about 2 seconds the big flies fell down on me, the big flies fell on my right arm, I was nervous at first a bit because of what i have bet is just manifested. so the flies walks gradually towards the end of my arm and i put my arm very slowly at the window to let the flies fly away. So, do you think its a fairy? and what those things i have experienced i’ve mentioned above?. Im so sorry for the long story, im just confused but little bit excited to see the results. Thank you very much for being such a nice person. Great post, thank you very much for writing it! From what you have written (seeing orbs and fast moving objects and your other experiences), it certainly sounds like you have something paranormal going on. Now, the question is, are they fairies? I don’t know for sure if there are fairies in the Philippines but I my guess would be that they are there. One easy way for you to find out what they are is to ask them next time you see or feel that something unusual is happening. Remember how you said “I’ve experienced most of the time that someone talking to me in my mind like calling my name or sometimes suddenly answers me when i have a question in my mind”? Well, try asking “who are you?” and listen for the answer. I think that’s the best way to get to the truth. It sounds to me like you are sensitive to the “other worlds” so I wouldn’t be surprised if the fairies could sense that and are trying to connect with you. Now, if you think there are bad fairies around, you might want to call out to good fairies because when they come around, the bad ones usually leave. You might also want to say “bad fairies or anyone with bad intentions are not welcome here” and then post the fairy protection rune near a door or window in your home. Good luck and please let us know how it is going for you! PS: You are very welcome and thank you for your nice words, we appreciate it! Are these symbols real? I mean, did you find them somewhere… or did you just came up with them? 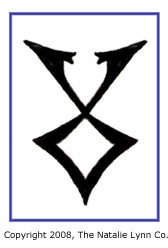 Yes, these symbols were given to us directly from the Elves of Fyn and they are real. I would like to know if human can be a fairy? And what is pixie dust? I’m not really sure about real pixie dust, I’d have to ask the Elves about that one. That’s really cool – sound like you are attracting that energy to you – probably with the help of the elven heart. thats cool thanks for all your help!!!! Thanks a lot for answering my post, really appreciate it. If its paranormal then i will have to face it as i encounter it sometimes. Yes, i have this feeling that i am close to connect with fairies and im a bit excited for that. I remember when i was a kid, my mother always told me that i was playing with the dwarfs people, i think they were Brownies. By the way, is it okey to sculpt that fairy protection rune with wood or silver metal? because im planning to sculpt it with silver metal or wood. Once again. thanks for your help. Have you ask the elves about the pixie dust or fairy dust? Thank you so very much for this wonderful website and the fine service you’re offering us fairy lovers. 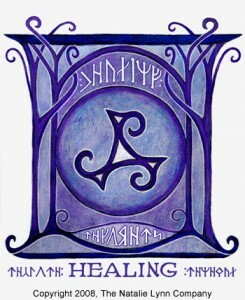 Could I please ask you if it’s ok to have the Healing Symbol in the bedroom the ‘patient’ is sharing with her husband? I’ve completed radiation treatment for breast cancer, and as far as I’m concerned, I’m cured, although without petscan confirmation, yet. So given this circumstance, do you recommend leaving the symbol in the bedroom, or house, to ensure the ‘conventional’ 5-yr remission, before one is declared cured? Please remember, even though it’s only been several weeks (6) since radiation therapy, I feel I’m over the hump. Also, re the truth symbol: Inasmuch as only truth will be spoken by others in our home, is it correct to assume that it goes without saying that the homeowners would be compelled to speak only truth as well? (I see I’m kind of answering my own question here) Does the ‘truth’ encompass hospital bills, telephone conversations, email communication, etc? We rent our home out to vacationers, and sometimes people are not forthright in their intentions, i.e. planning to hold special-occasion receptions of large numbers which they purposely don’t mention, or how many are actually occupying the house. By hanging or just having the Truth Symbol in our home, would the initial telephone or email enquiry on availability produce much more honest intentions, or would the ones with ulterior motives simply be deterred from contacting us in the first place? hi natalie, i want to ask…are fairies the same with genie/ jinny? thanks! Yes, Jinn and Genies are part of the fairy realm. you have the most helpful website on fairies ive ever seen! thank the elves for me as well!!! but ive been looking for more information on elves and otherkin but whenever i try to find books on the subject it comes up with something like the magic rainbow fairy. do you have any sugestions on other sites or books??? i beleive that i am part elf and your website really got me interested. -please and thank you! I’m glad you have found our site to be helpful, thanks! Have you tried searching in google for “otherkin?” Try Otherkin.net, it may be a good starting point. I was wondering…can they talk with us? Thanks for answer! 🙂 and please contact me, send me message how to make Amulet of Thruth on [email protected] tnx!! <3 love u all!!!!!!! Do you know where I can find more Fairy symbols? Do you know what type of symbols you are looking for or just any symbols?? Yes, humans can do magic if by magic you mean, the focusing and directing of energy. According to the elves, it is easier to work with energy in the fairy realm so, on the earth plane, we have to work harder for less results. But, it does work. I was just looking for any symbols really, none in particular. Hope you could hand me a help. Thanks. i was just wondering how do i make fairy cakes and what’s ale? Also where do I get fairy shoes and where do i get a thimble, is a thimble like a needle kind of? What else do you think they would like and beause i’m thinking of making a fairy house should i make it out of card board or actual wood and if fairies do come how many woulld visit in the house so how big should i make it? You asked: is it okay to print out the symbols, then attach another paper behind it, stitch or staples the side and place cotton inside it and then place it around your neck with a string? will the magic work if i did that? My answer is yes, that should work but I wouldn’t use staples. do you need any activating when you printed them???? ummm…..does it need any colors,too??? and also….how does it work??? How do I get over my skepticism? I know I believe, but I also know I’m not letting go completely because I’ve grown up in a very conservative community. I mean if my grand mother knew, she’d probably exorcise me. But I do believe, and I know I am not the same as everyone else I know. I live in Bordeaux in France, are there fairies around here. My dad also owns a property in a small village in southern france in the mountains, I’m guessing my best bet would be there. But I do love them. I often see blurs in the corner of my eye, but that is about it. I guess the only way to get over being skeptical is to have some experiences of your own. Blurs out of the corner of your eye could definitely be the fae so maybe you could talk to them (in your head so you don’t get in trouble 🙂 ) and see if they respond to you. Yes, anywhere in nature – the wilder the better – would be a good place to try and connect with them.